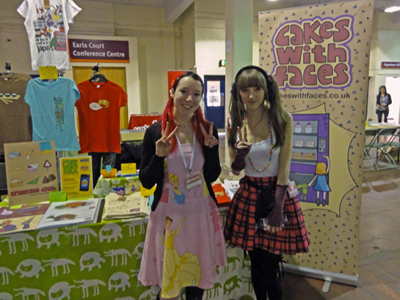 Thank you to everyone who came to see us at Hyper Japan, we had a fantastic weekend and hope you did too! 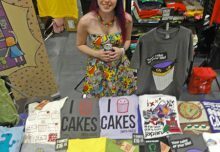 I’d been to the first Hyper Japan in Brick Lane as a visitor, but this was my first time having a stall there. It’s one of my favourite events because it’s about all different aspects of Japanese culture, and it has a great atmosphere. There were a good variety of stalls as well as a manga drawing workshop, origami, a judo demonstration, sushi and sake talks and a full stage programme over the three days, including Nasuko Aso and Beckii Cruel (who dropped by the stall to say hi!). 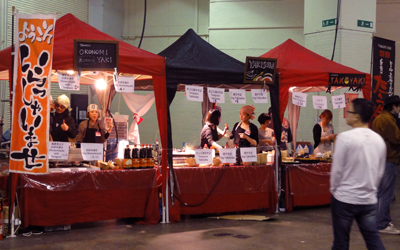 One of my favourite things about Hyper Japan is the food section, which gets really busy from lunchtime onwards. Instead of the usual overpriced convention centre sandwiches you can really treat yourself, with stalls cooking ramen, yaki soba, taco yaki and more. Although disappointingly not much sushi this time… I enjoyed some yummy pumpkin croquette katsu, and had okonomiyaki for the first time. During the quieter times I had a quick look around the other stalls, at the start and end of the day, and on Sunday when it was less crowded. Somehow I managed not to buy too much, but I did get K-ON 4, and a cute peapod necklace from Two Bad Bananas. 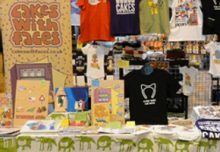 My new “All the best stuff is from Japan” t-shirt was on sale at Hyper Japan for the first time, and it was great to see that people liked it (some people put theirs on straight away!). We sold out of all womens’ sizes and the smaller mens’ sizes, so I’ve ordered some more already. 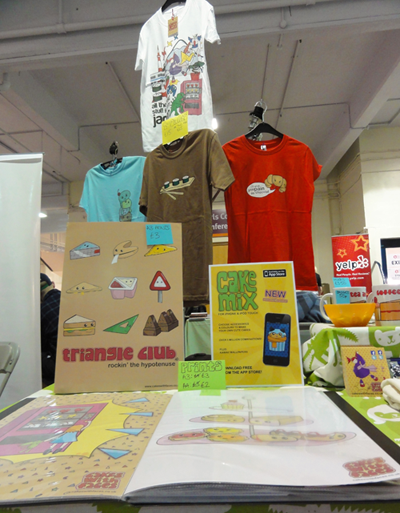 The croissant t-shirt also got a lot of attention, and Triangle Club was the most popular print. I took loads of photos of cosplayers, lolitas and people wearing anything unusual or colourful who couldn’t get away before I reached for my camera. You can see them all on my Facebook page. Feel free to add tags if you find a pic of yourself. When I got home I had some really lovely messages from people about the stall and my artwork – thank you!! It was a great weekend – there are rumours there’ll be another Hyper Japan in the autumn so look out for that if you didn’t make it to this one.